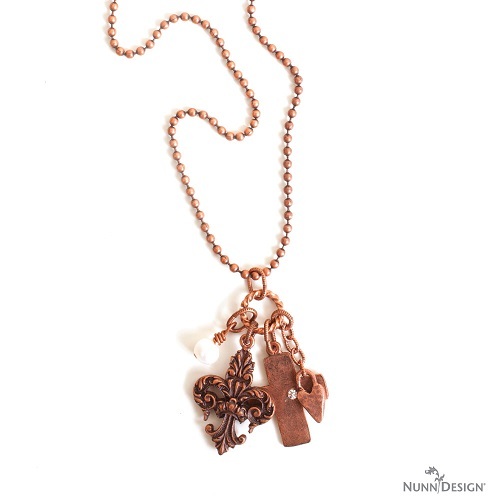 I think many if not most of you are, by now, familiar with the awesome jewelry findings from Nunn Design. The last giveaway for Becky Nunn's Summer Collection back in August was indeed popular! It's not hard to understand why. The findings are great quality and especially designed (by Becky) with the handmade jewelry maker in mind. There are many lovely designs in the gallery section of the website. I have picked a few designed by Becky herself which feature some of the items. She has some awesome ideas. The bezel ring below has a collage paper background. 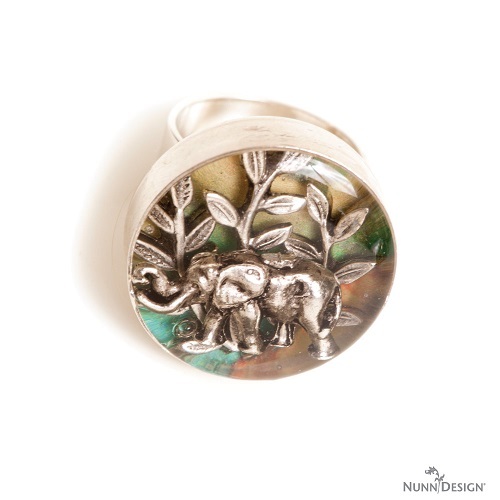 The elephant charm with fern leaf connectors are set in place with 2 part epoxy resin. She grouped a number of the charms for this necklace below. I like how she adorned the flat cross tag with a single flat back crystal. Becky used a metal hole puncher on a flat tag so she could add a dangle to it for this simple bracelet. Such a great approach to use gold tone wire, charm and jump rings to really make this design pop! This simple wire bangle has an awesome resin clay and crystal focal created in a double loop pendant bezel. 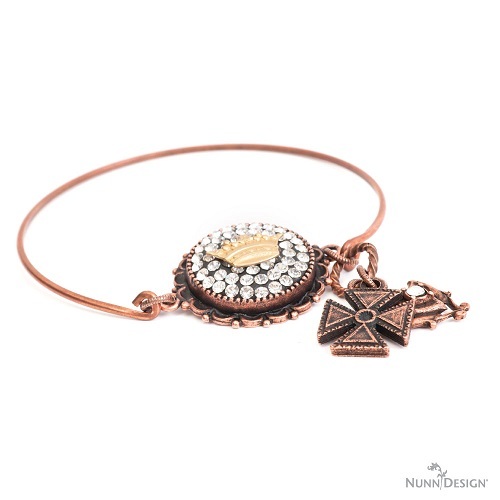 If you'd like to win $75 worth of jewelry supplies from Nunn Design - as shown above - please make a comment below. Make sure you leave contact info below if you do not have an online shop or blog. It ends in a week's time at 6 pm EST Monday, December 8, 2014 . I will pick the winner randomly and announce the results as soon as possible after. So be sure to leave a contact email if you don't have an online link or make sure you come back and check! Otherwise I will redraw in a week. Good luck! Would love to win! Thank you for the chance to win some beautiful Nunn Design's!! I love your products! Great quality on all the items I have gotten. Thanks for another great giveaway. This treasure trove of charms will, one day, be highly collectible. Wonderful artistry and truly eclectic! It would be a joy to be a winner. What a great prize, the ampersand is really very unique, I would put it on something special Thanks for the contest and i am also a follower. I would love the opportunity to play with these goodies! I think they would be a fun addition to my glass jewelry pieces. Thank you for this chance to win these beautiful items! Gives me sooooo many ideas! The ideas are rushing through my head!!! What fun it would be to have my number come up!! Thanks for the offers. like everyone who follows your blog I'd also like to win-can't think I'd have any problem finding things to do with all these great items. love her designs and findings! would love to win this and thank you for the chance! Gorgeous prize and excellent presentation, thank you! A loyal blog follower, would love to win. Thank you for this wonderful chance to win some gorgeous supplies! I love Nunn designs. I hope I win. Great giveaway. Magnificent! I have fallen in love with everything that is Nunn design, it's so classy. I simply love Nunn's designs. My stocks are running low at present due to the time of year, as well as the money. What a giveaway! I am blog subscriber, FB follower, etc. Thanks pearl for another great giveaway!!!! I'm happy subscriber of your blog. Regards! Your choice of beads and components is fantastic. These are my favorite colors!!! Would love a chance to play with these fabulous Nunn design goodies! Thanks for the opportunity. Well it's time to give another try at winning a great prize. I'm a Nunn Design addict! Love her stuff! What a great contest! I just love Nunn Design. I would love to win this, thank you for the opportunity ! I have had a lot of fun with The Nunn Design ring blanks! Would love to win! Lovely giveaway. Love all things Nunn. I absolutely love Nunn Designs, everything is such quality, with unique touches. Love everything from the 2014 catalog! Would love this gift! I'd love to try out that epoxy resin tutorial using these deep rings! 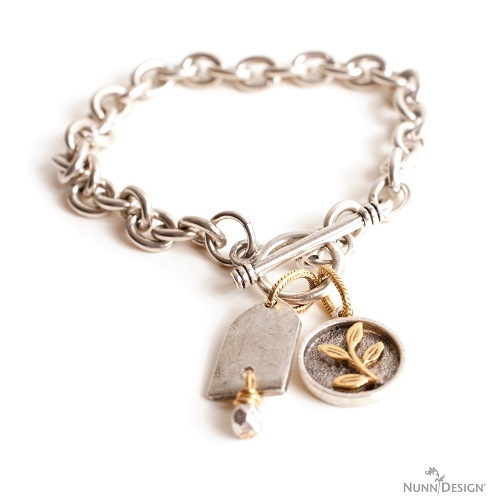 Love Judy Nunn Designs, simply gorgeous. Thanks for the chance to win. Looks like a great giveaway! Fantastic items. I would love to win. Thanks for the chance. Wow amazing giveaway, just love Becky Nunn and all her pieces. Thanks Pearl! Thank you for a chance to win this Nunn Design collection. It's fantastic! I love their things. I'd love to win this. When Becky Nunn entered the jewellery world - things changed for the better! Her designs are on the upper end of simple and are elegant and make a statement all on their own! Looking at that Fleur de Lis charm gives me a little shiver as I love them (Fleur de Lis'). And Becky's is one of the prettier ones I've seen! It's classy and all the scroll work on it is superb. I guess I'm saying - throw my name in there Pearl. I'll give it a whirl once again! Just subscribed to you. I would be in HEAVEN if I won these :) I only use Nunn Design metal bases for my pieces. I have always lived Nunn - was thrilled when they expanded their bezel line years ago. Back surgeries interfered in my creative endeavors and now, after seeing how Nunn has expanded their line to multiple mixed metal components, I am excited to be able to use them in my designs - I've been metalsmithing for a year and a half and these would be PERFECT for me to utilize in so many ways in my designs...I've posted this blog post to Facebook, tweeted it AND pinned it to my Pinterest page. Thanks for the opportunity to win such great products! You have the best reviews and giveaways, Pearl. I am a subscriber and loyal follower. Awesome giveaway for the holidays! I would love to have some great Nunn design items to make holiday gifts with. Nunn Designs has good products. Love your products and your blog, great design ideas! I am a subscriber,and I am absolutely in love with all of your components. And you freely give tips on how to incorporate them in various pieces. I am a new designer who took this up when I found out I had Lymphoma and decided to try things I thought I couldn't do but had always wanted to do. YAY, I'm in remission, but I've had a grueling year to practice and though I will never be a designer up to the par of you and many of the commenters here and surely don't deserve to win, I would love just the opportunity to see and touch and get the feel of what you do. Winning doesn't matter (we cancer survivors get over that part of life pretty quickly), but I do welcome the opportunity to tell you and the community at large how big a help you were to me and how much you have all taught me. The spirit of generosity, wonder, delight in the ability to share some way in the joy of creation: all of this IS LIFE. So, one big thank you to you and everyone else here (and not here) for taking the woman whose father once called her "two left hands" and teaching her she can do ANYTHING she wants to do, no matter what. What gorgeous components! I would love to have these to work with... getting them for free would be like an early Christmas! I love Becky Nunn's designs! She comes up with such beautiful, creative designs that inspire me. Her pieces are well-made & mix so well with one another, so it's easy to use multiple items in one piece of jewelry without looking like a mish-mash. I'm a blog subscriber & I follow you on Facebook. This company makes some of the best base metal findings around. Thanks for all these awesome give away posts! I would love the opportunity to use these findings in making some holiday gifts this year. Such Ideas come to mind when looking at this collection. What fun to 'play' with these wonderful toys !!! Her deep bezel rings are my favorite! Thanks for the chance to win this awesome collection. I'm a blog follower as well. NUNN design goodies would be wonderful to win. Always look forward to your blog and FB posts. Love Nunn Design products! Isn't the Fall Collection just the cutest?!! Thanks for the chance to win! Lovely contest and wonderful Nunn Jewelry Collection. I would really love to win and share my creations on my ETSY shop Isle Of Craftin. Wonderful Copper goodies. Thanks for the chance to win! This looks like an amazing contest! I would love to win and have a good start to my art and craft stalls. OMG this is lovely. I would love to have a chance to win this. Thanks for offering us opportunities to see & win things we might never know existed without your blog! What a great giveaway! Thanks! I love Nunn products; they are pretty and very sturdy. This collection looks wonderful! Love this! Can't wait to start experimenting with my crystal clay. I am a blog subscriber and sharing on Facebook. I love the Nunn Designs components and the 2014 collection is super awesome! Great giveaway!! Love Nunn Designs! Hope I win! What an awesome give-away! I love Becky Nunn's designs but they are sometimes a little outside my budget. Thanks for running this. As always, love your blog..
LOVE Nunn Design! Thanks for the chance! !